The W.K. 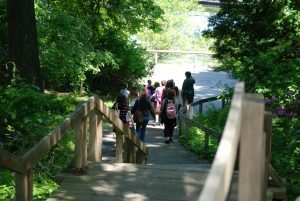 Kellogg Bird Sanctuary welcomes groups of all ages! Discounted rates are available for groups of 10 or more people. The group visit rate will only be applied if you have 10 or more people in your group. If your group is less than 10, the general admission rate will be applied. Fly your flock over to the W.K. Kellogg Bird Sanctuary! If your group is interested in a guided tour or field trip, it should be scheduled at least four weeks ahead of your preferred date. Group visits can be scheduled up to a day in advance. Please fill out the form below or contact the Sanctuary by phone at (269) 671-2510 or email birdsanctuary@kbs.msu.edu. Please note that no reservations are considered final until you receive confirmation by a Sanctuary staff person. Click here to schedule your group’s visit today! Applications are due by February 28, 2019 for field trips in April, May, and June. If the scholarship amount is more than the cost of the bus travel, the difference can be put toward field trip or guided tour fees at the Sanctuary. Click here to apply for a Bus Scholarship for your group! If you are interested in visiting other areas of the W.K. Kellogg Biological Station with your group, like the W.K. Kellogg Manor House, please fill out the KBS Group Tour Contact Form. 2019 Bus Scholarships for School Groups!